After undergoing 14 surgeries of her own, Makenna Schwab raised enough money in a campaign last October to buy 33 Radio Flyer wagons, 36 portable DVD players and more than 1,300 toys and other goods to donate to Seattle Children’s Hospital. WENATCHEE — Makenna Schwab knows how to really make a difference. The 12-year-old Wenatchee girl was picked as a national Make A Difference Day award winner Thursday by USA Today. She will receive a $10,000 grant to further her charitable work. USA Today will host a formal awards event for Makenna and other Make A Difference Day award winners May 6 in Washington, D.C. 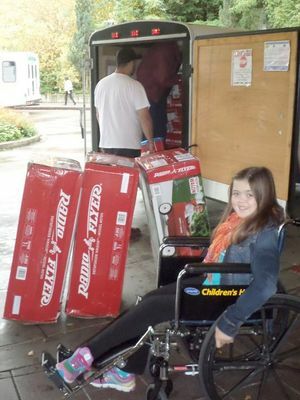 In her Make A Difference Day campaign last October, Makenna raised enough money to buy 33 Radio Flyer wagons, 36 portable DVD players and more than 1,300 toys and other goods to donate to Seattle Children’s Hospital. It was the fourth year Makenna has led a campaign to raise money for the hospital. Her contributions now total more than $7,500. Last year’s efforts were largely driven by those red Radio Flyers. Born with Larsen syndrome, a rare connective tissue disorder, Makenna has spent a lot of time in one of those wagons at Children’s Hospital. The disorder causes bone dislocations and affects her airway, spine and joints. Makenna has now undergone 14 surgeries related to the disorder and there are likely to be more, her mother, Melissa Schwab told USA Today. The hospital began using the wagons several years ago to move young children like Makenna who are too small or just don’t fit because of casts in a wheelchair or stroller. The hospital specified the wagons as one of their greatest needs from donors last year. When Makenna found out, she challenged the community to donate wagons or money to purchase them. She said she hoped to raise enough money to purchase five wagons. She ended up donating 33. Makenna attributed the project’s success to her “awesome” community. “I’m a 12-year-old girl and they came behind me and wanted to support my project,” she told USA Today.